Tall and imposing, the Monolith fabric displays are guaranteed to grab your attention. Available in several widths and seated on a heavy metal base, the Formulate Monoliths promote a strong brand image. As the name suggests, these monolithic structures demand your attention; tall and broad, the fabric graphic hides the lightweight and portable structure beneath. 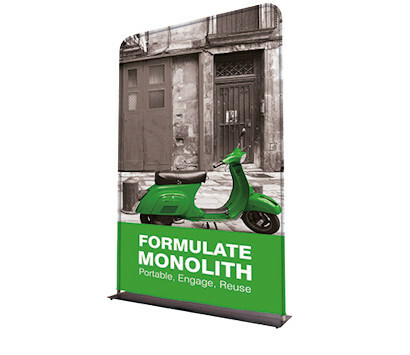 Constructed from 32mm aluminium tube, the Monolith is a great alternative to more traditional banner stands.